Note: Names of streets, squares etc. used below and on the map above are as they are today. City trams (horse-drawn): 14 Oct. 1892 - 1905; (electric:) 6 May 1894 - today. 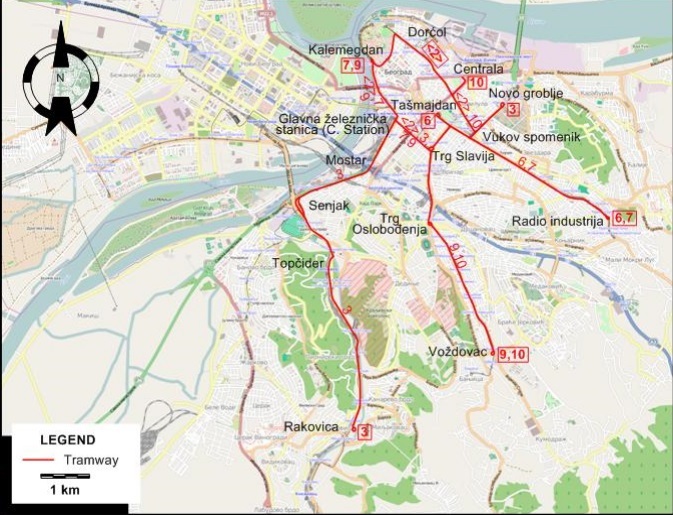 Dussart-Desart, R. "Belgrade - Plans for expansion" Tramways & Urban Transit. July 2007 (70: 835), p.270-274. Dussart-Desart, R. "Light rail in Belgrade - today and tomorrow" Tramways & Urban Transit. Sept. 2007 (70: 835), p.344-345. Jenkins, M. "Developing the Beograd tramways" Modern Tramway & Light Rail Transit. July 1985 (48: 571), p.234-239.